Houston right-hander Gerrit Cole (1-2) pitched six strong innings for his first victory of the season. He allowed two runs on four hits with no walks and 11 strikeouts. The Mariners’ Mitch Haniger led off the bottom of the first with a home run off Cole. That gave the Mariners homers in each of their first 18 games to begin the season, extending their major-league record. The Mariners made it 2-0 in the third as, with two outs, Haniger and Domingo Santana hit back-to-back doubles. 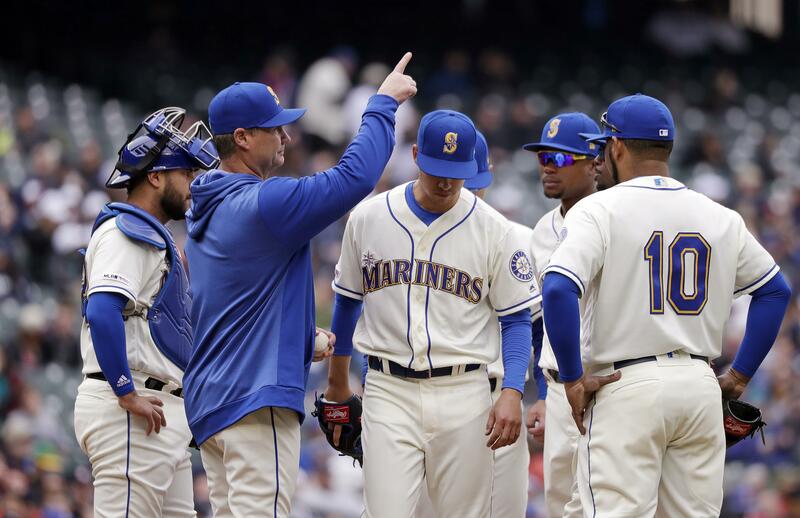 Mariners left-hander Marco Gonzales (4-0), who allowed just one hit through the first five innings and kept Houston off the scoreboard, ran into trouble in the sixth. Tony Kemp led off with a single to center field and advanced to second on a one-out single by Altuve. Alex Bregman singled to right to load the bases. Michael Brantley then grounded a two-run single to right field to tie the score and end Gonzales’ afternoon. Houston 2B Jose Altuve’s home run streak ended at five consecutive games. … Mariners RHP Brandon Brennan, who was selected in the Rule 5 draft, opened the season with eight scoreless appearances before Diaz lined the first pitch of the seventh over the left-field wall to give the Astros a 3-2 lead. … The M’s traded C David Freitas, who was at Triple-A Tacoma after starting the season in the majors, to Milwaukee for minor-league RHP Sal Biasi. 28: The number of strikeouts by Mariners batters over the past two games. Astros starters Cole and Justin Verlander, who guided the Astros to a 3-1 victory Saturday night, both fanned 11 without walking a batter, with the Houston bullpen contributing six scoreless innings with six strikeouts over the two games. Perhaps these Mariners aren’t ready for prime time. By losing all three games of the weekend series to Houston, their lead in the American League West is down to one game over the Astros. Haniger accounted for both runs Sunday and is starting to heat up; and Gonzales showed why he’s the team’s new ace. But other than those two, and a quality start by Felix Hernandez on Saturday, not much went right for the M’s. The M’s open a three-game series with the Cleveland Indians at 7:10 p.m. Monday at T-Mobile Park. Indians RHP Trevor Bauer (1-1, 2.29 ERA) is scheduled to face M’s LHP Yusei Kikuchi (0-0, 4.15). Published: April 14, 2019, 4:10 p.m. Updated: April 14, 2019, 4:20 p.m.